What to look for in an inventory optimization software? Inventory optimization software refers to a software solution used by operational and financial managers to control and optimize inventory levels across a network of warehouse locations. The software keeps track of the various parts and materials already in stock and helps analyze what inventory should be reordered and what inventory should not be purchased due to too much overstock already on hand. In this new era of globalization, many systems now include fully automated inventory optimization that works collaboratively with older legacy Enterprise Resource Planning (ERP), Material Resource Planning (MRP) and Warehouse Management System (WMS) technologies to enhance inventory performance. Inventory optimization software provides information on how the warehouse should be optimally utilized and maintained based on historical sales and demand data from other legacy systems. Advanced tools can even be bi-directionally integrated for seamless data hand off and management between the two applications. There are many types of optimization softwares out there, but finding the best software for your business can be a challenge. Here are several important features to look for when evaluating inventory optimization software. Integration Capabilities: It is important that the software features include an application programming interface (API) that can exchange data with other systems (such as an ERP system). This is particularly important if additional optimization software is added in the future to support inventory control systems already in place. If any information is missing, many solutions will provide suggestions for storage, such as how to optimize inventory and how inventory costs can be reduced. Data Security: It is important that the optimization software have sophisticated data security features. With digitalization, more and more companies are seeking to have access to their warehouse data anytime, anywhere. New IT trends, such as cloud computing, enable 24/7 access to data where users can login to application systems to view and analyze trends or execute purchasing orders. Data that is stored on an external server sometimes can come with security considerations that should be a major priority when evaluating solutions. Service providers like Amazon Web Services are a good example of a secure systems provider for data storage and control that is off premise, meaning they manage all the nitty gritty details. Access control, physical security, environmental controls, power quality, network protection, high bandwidth, secure data transmission, perimeter firewalls, and automatic backups of data are necessary components of good storage software for every provider. Be sure to contact the seller to clear potential security risks out of the way. Implementation Costs & Deployment: Implementation and associated costs are important factors to weigh when considering on-boarding new technology. Many solutions require longer implementation periods, with additional IT infrastructure needed to support data capture and various data being loaded onto on-premise systems. Implementation also often includes additional costs to cover on-going maintenance or other services. The initial results of the software should create a realistic idea of optimization for each warehouse and prove that a tangible return on investment (ROI) can be achieved within a reasonably short time frame of a few years. On-premise solutions tend to be very costly and can take years to implement, which can effectively drive out a tangible ROI years or decades! Most cloud-based inventory optimization software is offered as Software-as-a-Service (SaaS) solutions that do not require any investment into infrastructure, IT hardware, or software. Additionally, they do not require on-going maintenance or service costs. The integration and setup of cloud-based applications can be finalized within weeks and can be working towards delivering ROI within months of deployment compared to more complex on-premise solutions. Overstock & Excess Stock Reports: Visibility into overstocked items and older stock that may not have demand anymore helps companies make smarter decisions regarding what items should be carried or ordered to keep in inventory. Many companies have no idea how much excess stock or obsolete inventory is jammed in their warehouse, which leads to unnecessary storage and carrying costs. : Optimization software goes beyond simple ERP demand forecasting. Optimization software dynamically calculates demand forecasts based on historical sales and demand patterns to extend insights into future customer needs and demand shifts, whether they be negative or positive, to ensure the precise product life-cycle is being taken into account for all inventory items. Automatic Order Replenishment: Intelligent inventory optimization software should have automatic reorder functions that are tied directly to the ERP or WMS. This feature is especially nice for popular products in inventory to prevent the warehouse from selling out and creating costly stock outs or backorders. Multi-Echelon Redistribution Planning: If you have multiple warehouse locations, a multi-echelon redistribution planning function may be needed since the goods you carry can typically be easily distributed between the warehouse locations instead of incurring additional working capital costs or carrying costs by ordering unnecessary items from an external supplier. Redistribution lessens the burden of lead-time variability and reduces reliance on extern suppliers for new goods. 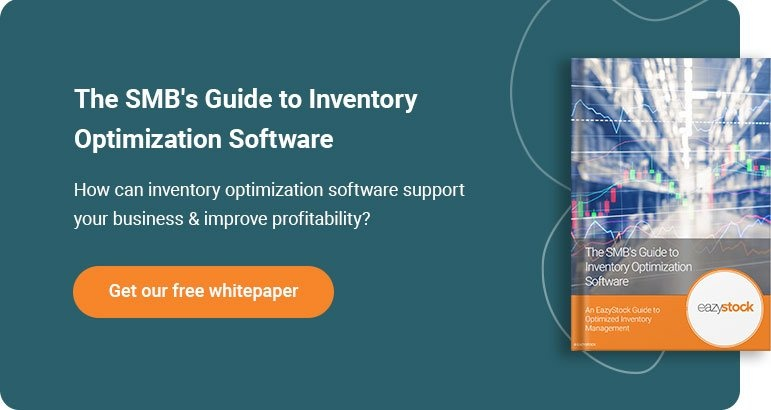 To find out more on optimizing your inventory, including best practices for small- to mid-sized businesses, download your copy of our free white paper here!